In the fast-growing and rapidly changing world of cloud infrastructure services (IaaS) such as cloud computing and cloud storage, Amazon (AMZN - Get Report) , Microsoft (MSFT - Get Report) and Alphabet's (GOOGL - Get Report) Google are quickly distancing themselves from the pack. That spells trouble for the long list of would-be rivals who typically don't have as much scale or offer as many features as the leaders. 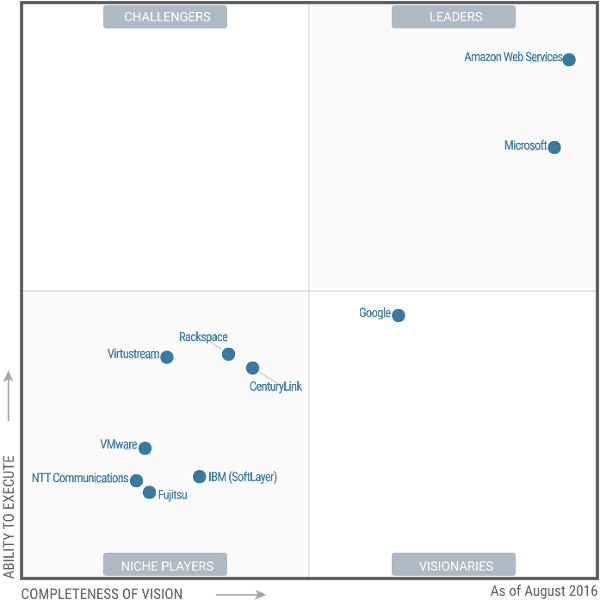 As was the case in its 2015 report, the 2016 edition of research firm Gartner's closely read IaaS Magic Quadrant report places only Amazon Web Services (AWS) and Microsoft Azure in the report's "Leaders" quadrant, which features cloud platforms receiving top marks both for the completeness of their vision and their ability to execute. Amazon, estimated by Synergy Research to produce more cloud revenue than the next three biggest public cloud providers combined, still has the most prestigious spot in the quadrant, well inside the top-right corner. Microsoft's position along the "ability to execute" axis is improved, and its position on the "completeness of vision" axis is almost even with Amazon's. Gartner's 2016 IaaS Magic Quadrant reflects well on Amazon and Microsoft, and to a lesser extent Google. Google is once more in the "Visionaries" quadrant, which features companies with fairly complete visions but less ability to execute than the leaders. However, unlike last year, Google is alone in this quadrant, with three other players -- IBM's (IBM - Get Report) SoftLayer unit, VMware (VMW - Get Report) and CenturyLink (CTL - Get Report) -- demoted to the "Niche Players" quadrant, which features companies holding low positions on both axes. Rackspace (RAX , reportedly close to selling itself, is also labeled a Niche Player, as are NTT, Fujitsu and EMC's (EMC Virtustream unit (acquired last year for $1.2 billion). Alphabet is a holding in Jim Cramer's Action Alerts PLUS Charitable Trust Portfolio . Want to be alerted before Cramer buys or sells GOOGL? Learn more now . Gartner once more gushes with praise for AWS, which saw revenue rise 58% annually in the second quarter to $2.9 billion. AWS is declared to offer "the broadest range of use cases," as well as "the richest array" of both IaaS and PaaS (cloud app platform) services and a giant ecosystem of software partners, IT services partners and open-source tools. "[AWS] retains a multiyear competitive advantage over all its competitors," Gartner proclaims. The firm also notes AWS' compute capacity is "many times the aggregate size" of all other cloud providers. It does caution optimizing AWS usage requires expertise, and that its pricing structure is "complex." Microsoft, which reported its Azure revenue rose 102% in the June quarter (no figure was given), is praised for providing "IaaS and PaaS components that operate and feel like a unified whole" (important for many enterprises), and for rapidly rolling out new features. Gartner also points out Azure integrates well with on-premise Microsoft software, and that Microsoft has been discounting Azure to grow adoption within its corporate base. "Although Azure is neither as feature-rich nor mature as AWS, many organizations can now consider it 'good enough,'" says Gartner. It does note Azure's enterprise functions sometimes aren't implemented as well as customers want, and that building out Azure's ecosystem is still a work in progress. Google gets high marks for leveraging the tech resources and expertise it has used to build out its internal infrastructure to deliver cloud services that are both innovative and scale well, and which are well-suited for apps built from the ground up to run in the cloud. Its analytics and AI/machine learning capabilities also get high marks. But Gartner admits "the scope and feature set" of Google's IaaS and PaaS services still don't compare with Amazon and Microsoft's, and that the company "is still in the rudimentary stages" of learning how to deal with large corporate clients -- new cloud chief Diane Greene is working on the latter issue. Why did Gartner send IBM/SoftLayer, which has made big noises about its public cloud platform and is often viewed as a top-4 player, into the "Niche Players" quadrant? While positive on SoftLayer's offerings for smaller businesses and those looking to deploy bare-metal servers, Gartner asserts SoftLayer's feature set hasn't improved significantly since IBM bought the company in 2015, that it lacks many of the features sought by larger businesses, and that IBM's cloud efforts are shifting away from SoftLayer towards integrated IaaS and PaaS services offered through its new Bluemix platform, which runs on top of SoftLayer's infrastructure. The last point may be key. Bluemix, aided by both the artificial intelligence and analytics services IBM is providing app developers and the services created for verticals such as healthcare and financial services, could allow IBM to be a major player in PaaS, even as its position in the standalone IaaS market declines. But being relegated to niche status in the standalone IaaS market would still be a big loss, given how many enterprise server workloads -- some of which run on IBM servers and software -- are moving to the cloud. A virtuous cycle now exists for Amazon, Microsoft and Google, one in which the size of their cloud platforms gives them greater economies of scale, results in more developers and IT services firms joining their ecosystems and helps justify bigger investments in new features. Those cloud infrastructure providers unable to benefit from such a virtuous cycle might end up fighting for scraps.